The first step is to make the pili flour or meal. After roasting in the oven, I placed a lot of pili nuts in a food processor, added a tablespoon of powdered sugar and blitzed carefully, pulsing every now and again, trying to get a relatively fine meal, but not making pili butter. This ended up looking a bit like grainy peanut butter, and was by no means as fine as good almond flour, so I knew this was going to be a rather “rustic” version of marzipan. I made roughly 4 cups worth of pili nut meal. 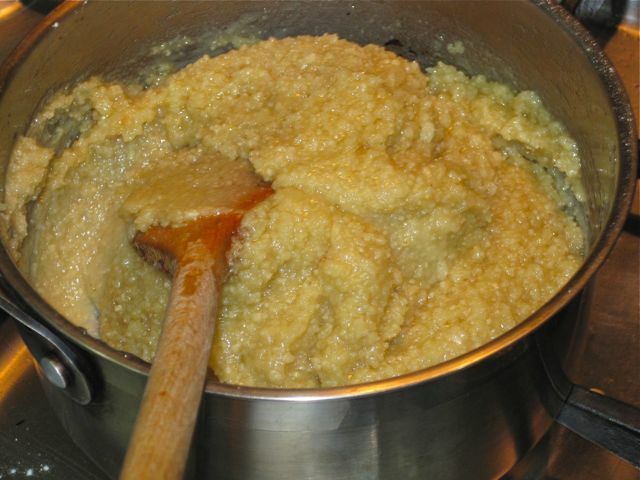 Next I made a sugar syrup with 1 and 3/4 cups of white sugar, 2/3 cup water and once dissolved, added the cream of tartar and followed the same instructions as the link above to the basic marzipan recipe. Add the egg whites as instructed. I split the batch of marzipan into two mounds on a marble counter. 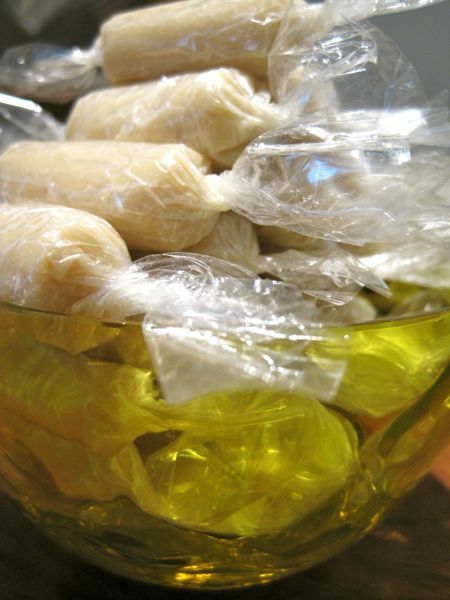 One mound I rolled into small marzipan candies and wrapped these in clear wrap similar but not the same as cellophane. Into the second mound, I added finely minced dried mango and wrapped these up in little pouches. Once they cooled they were pliable, nutty, marzipany, and delicious. Probably the last only because I had made them myself. :) But as the candies got cooler, and we put them in the fridge, the crew munched on them constantly, and guests of ours at one dinner all seemed to like the candies, so I gather they were a hit! So there you have it… so simple to make something I had always seen or come across and had never thought to make for myself. I wish more and more restaurants and bakeries would go back to basics and make use of wonderful local ingredients such as pili nuts so that we can not only preserve ingredients, traditions and flavors, but encourage that which we raise ourselves. I can see a wonderful danish being made with a pili nut butter of sorts rather than hazelnuts, or a pili spread, etc. 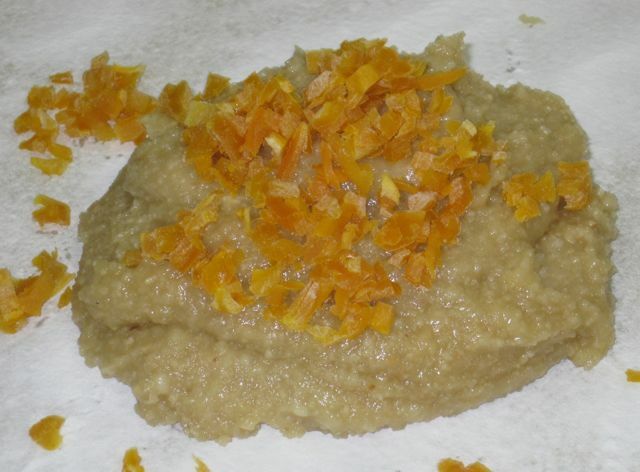 Pili anything is wonderful :-) Any chance of posting sister’s pili cake recipe? BTW, in case anyone is interested, the first locally produced National Geographic Channel show ever is on street food. It will air on Sunday, July 31. Put together by Mitzi Borromeo, it’s a 3-part series on the Pinoy food culture. I’m thrilled for her and her crew and looking forward to watching it. I’m a big fan of marzipan and any kind of nut flavored paste. The ones from Spain called mazapán are usually the tastiest and the most consistent in quality since they have to conform to the standards of their Denominación de Origen Protegida and use their famous local marcona almonds. I also use pistachio paste when I feel like splurging on some luxe munchies. To me it is the absolute apogee of all nut pastes. Our mazapán de pili and mazapán de casuy follow right after it in rarity and uniqueness of flavor although few in the world know. Apparently a lot of the less expensive marzipan from Europe are made from apricot and peach kernels which when ingested in large amounts can cause cyanide poisoning. I do not know how they get around the strict Euro food regulations with that. 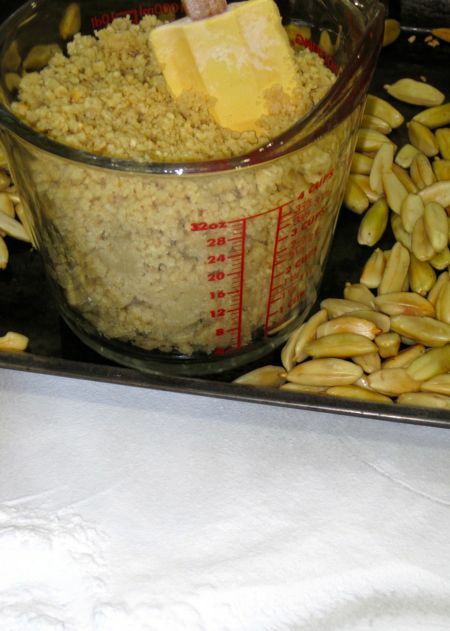 Anyway, casuy and pili paste are great substitute for almond paste in the making of soft amaretti cookies. But if you are wondering where to put to use the puff pastry that Artisan supplies you, you can try your hand at turning out Pithivier filled with fresh cashew or pili marzipan. Pure luxe. MM…Pinoy frangipane! … tartlets with shortcrust pastry, then frangipane and caramelized apples or pears or mangoes and baked. …or how about mixed in with creme patissier and used as filling in a danish. Footloose, I once made baby pithiviers (about 400 of them) for a charity event…a REAL PAIN IN THE ….considering the amount of time I spent making the starburst on each baby pith., people just plopped them in their mouth in no time at all! that easy? i thought it took many hours of mixing, with milk and so on. thanks, MM! pili is my second favorite nut, next to cashew. i think adding dried mango is another brilliant original MM idea. i’ve tried some bicol versions that had something like candied suha (pomelo) rind, i think. delicious too! the large-ish bits were tinted red so i’m not sure. does somebody know what it is? at first i thought they were bits of red pepper. I like nuts a lot that it shows in how I write comments. how about croissants filled with pili marzipan, instead of using almond marzipan. i’m so looking forward for my friend coming back to uk. she’s back home at the moment on holiday and she promised me some pili nuts. In Sweden this tool is called Mandelkvarn (almond grinder/mill, but it really doesnt grind the nut but instead grates it). I don’t know if this can be found in the Philippines or in the US. I’ll gladly send you one MM, if you want. I have very fond memories of pili as well. I love anything made of Pili. My parents come from Camarines Norte and we would have pili nuts in all sorts of form whenever relatives come to visit us. Pili nut brittle and Tikoy with Pili are my favorites. Yum yum! I miss pili so much, sometimes I’d make my own version of the tikoy of my childhood (brown sweet tikoy) and substitute almonds for the pili…although it’s not as good as having real pili…..
Oh my gosh.. this is how its done. I am sending this recipe right away to my folks in Quezon and i want them to try them. Para pag-uwi ko sa April alam na nilang gawin, hihihi, para kumain na lang ako. I am also going to reserve na the pilli harvest dun sa neighbor nila. Thanks again MM for the post. 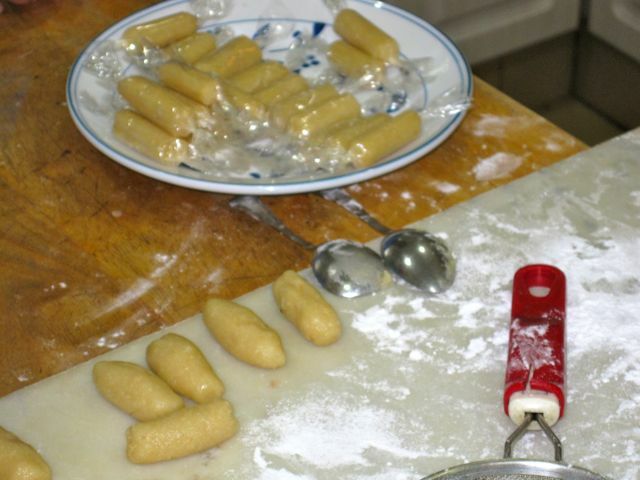 MM, your marzipan looks yummy but making them is so labor-intensive pala. No wonder marzipans are kind of pricey. Have you tried J. G. Niederegger Marzipan from Lubeck, Germany? It is supposed to be one of the popular marzipan brands. We were fortunate to visit the place where they are made and it was interesting to find so many sweets, cakes and pastries with marzipan as the base ingredient. We got some of their marzipans and dutifully lugged them around during our vacation only to find them being sold at a duty free shop in Schipol airport right before our flight back to Manila!! I actually still have 1 small tin of marzipan with bitter chocolate which I’d be happy to share. But if you ask me, I still prefer our local pili nut version from Bicol over these European almond types. I wonder if someone thought of making a pilinut version of nutella – using pili instead of hazel nuts + choco…maybe a chocopil or pilicho? Footloose, new word of the day: apogee. Had to consult google for that. I am beginning to hate my English Profs. Bettq, my sosyal neighbor said something about pithiviers and I pretended to know what she was talking about. Next time, I’ll say: A friend of mine said they’re a pain in the… to make! I watched a feature about nuts and that’s when I heard about marcona almonds and it was a light bulb moment when I thought about substituting pili nuts for marcona almonds. I made pili marzipan but used it to make almond cake. It was very good indeed! Will try candies like yours next time. Though the Philippines is the biggest commercial producer of pili, it turn rancid fast hence, the quality can’t be consistent. I never liked pili because I always had the rancid ones but when I was given freshly picked ones, I realized what a gold mine Bicol has. Thanks MM for the recipe.Simple and easy…..now, where to get my pili nuts? Love Marzipans! Thanks for this recipe! 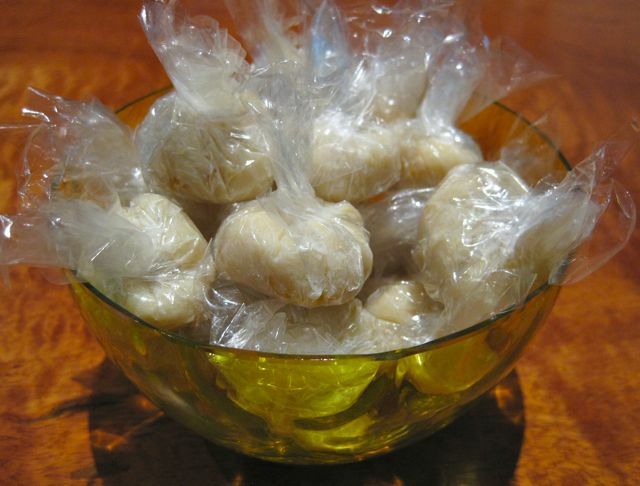 Hmmm…pili nuts, this post brings back a lot of childhood memories back in the Philippines. I remember when I was in gradeschool, every summer my sister and I would spend our vacation in Quezon Province, my uncle used to have pili trees and he would get them in baskets. So delicious when they’re fresh! Those were the good ol’ days. Thanks for your post, I’ll be trying the marzipan soon.